These adorable rainbow wall hangings have been very popular for some time now. I’ve been eyeing them on Instagram thinking how there must be a way to DIY them, especially without sewing. I know how to sew, but I know it can be daunting to many, so why not figure out a version that all you really need is some hot glue? Well here it is, the No Sew version of the Rainbow Wall Hanging. *the thickness of the rope is up to you. I used a fairly thin rope for the version pictured. You can find these items at your local Michaels, Dollar Store, and/or Hardware Store. 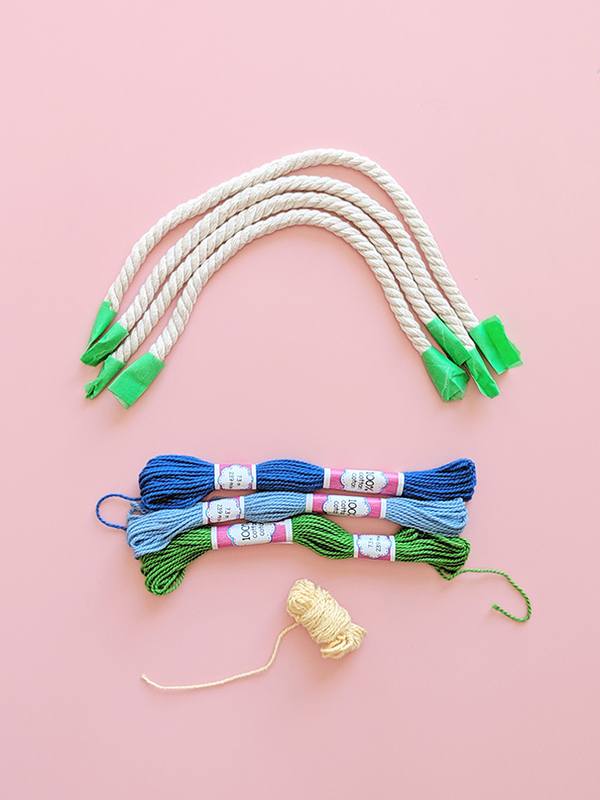 Step 1: The first step is to lay out your rope. Figure out how large you want your hanging and how many colours you’d like to add. Obviously I chose 4 bands for my rainbow, but the more the merrier. Step 2: Next cut the rope to make each section. Remember to allow for some fringe so you might want to extend the size. 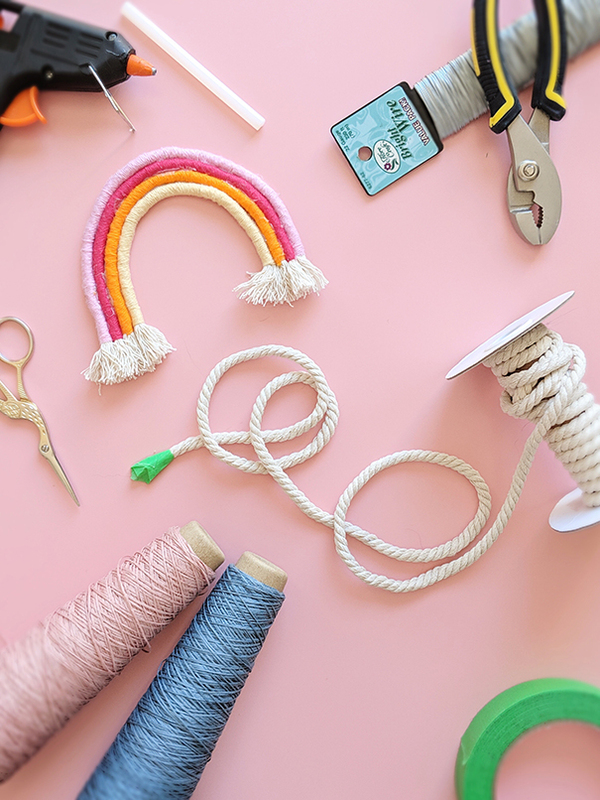 You can always trim the rope smaller, but can’t add extra length so longer is definitely better. Tape the ends with painters tape (or masking tape) to stop them from fraying while you’re working. Step 3: Next is to prepare your embroidery thread. I find the thread is easier to work with when wound into a ball. Take your two fingers, index and middle, and start wrapping the thread around. Take care not to tangle the thread as you go, trust me it’s a big pain if you do. Step 4: Next cut the craft wire to size. I did this by taking each strand of thread and holding it alongside the wire. I cut the wire with wire cutters so it was slightly shorter than the rope. Roughly where I wanted the fringe to begin on each section. Step 5: Time to setup the embroidery thread. First take the wire and lay it along the rope where you want the colour to begin and end. This is where the optional clear tape comes handy. If you find it easier you can tape the wire to the thread. Use a thin piece as you’ll be wrapping the thread over this tape and don’t want it to stand out. Step 6: Take the embroidery thread and make a “U” shape just slightly above where you want the colour to begin on the rope. You can see this demonstrated in the first picture above. Next start wrapping the thread back around the rope and the “U” shape. Doing this will stop you from having to knot or glue this end of the rope. You can see in the second picture that the tail of the thread ends up sticking out and you can trim this when you’re finished. Continue wrapping all along the thread taking care to cover every inch without any rope peaking through. Step 7: Now that your rope is nearly covered in thread stop and evaluate how much wire you have left. You may chose to trim it again close to where you want the fringe to begin. Do this before finishing wrapping the thread so you can avoid having a sharp edge exposed. Step 8: Finish wrapping the thread to the point you want the fringe to begin and then tie a knot, as seen in the second picture. Step 9: Now place a small dot of hot glue by the knot and press the end of the thread down on the glue. Use a pencil or another object so you don’t burn yourself. Trim the end of the thread. Note that the side with the glue should be the back of your rainbow. Step 10: Repeat steps 1-9 until you’ve finished each section. Step 11: Now that you have each section wrapped in your chosen colour we need to glue them together. Do one section at a time and make a thin strip of glue aiming toward the back side of your rainbow and stick the sections together. Remember hot glue dries fast so do small sections along the arch until you’ve attached it all the way around. Step 12: If you have any gaps, as seen in the second picture above, you can add a small amount of glue to connect them. Remember to add the glue towards the back. This way you wont see any glue marks from the front of your work. Repeat these two steps until all the sections are glued in place. Step 13: Add a hanger. I definitely forgot to take a picture of this, but it’s fairly straight forward. Take a small amount of embroidery thread and loop it. Attach it to the hanger with a small dot of glue, pressing the thread into the glue with a pencil or other object. Voila! You now have a new rainbow wall hanging! If you make one please share any pictures with me via Facebook or Instagram!